SURREY, BC – Central City Brewers + Distillers has announced the release of a new holiday beer created and released in collaboration with The Jeff O’Neill Show on CFOX 99.3 FM. This full bodied Irish-style Stout is smooth, dark and creamy with pleasant notes of baked gingerbread on the nose and palate that will make this an instant holiday classic. The use of oatmeal and ginger in the mashtun adds silkiness to the texture and body of this ale. Hints of roasted barley, chocolate and crystal malts combine with a warm lingering finish of ginger and cinnamon that pleasantly round out one of our richest creations to date. 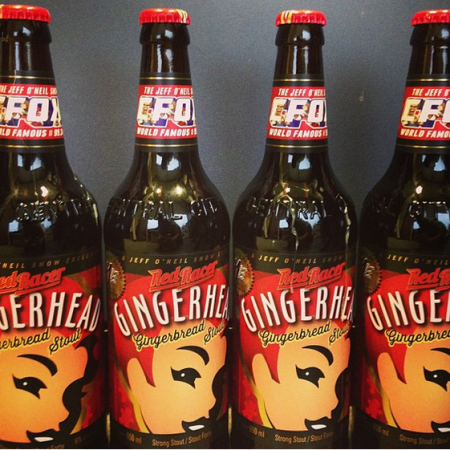 Red Racer Gingerhead Gingerbread Stout is available now in British Columbia, with distribution to other provinces and the US to follow soon. $1 from each 650 ml bottle sold will be donated to local BC food banks.